When the demand for its communications capacity increased dramatically in 1985, Satellite Business Systems (SBS) chose to purchase a larger, more powerful platform from Hughes Space and Communications Company, today known as Boeing Satellite Systems. SBS became the first customer to order the Hughes HS-393 spin-stabilized model. SBS 6 was launched from Kourou, French Guiana, aboard an Ariane rocket October 12, 1990, as part of a dual payload for Hughes Communications, Inc. (HCI) -- the Hughes subsidiary that bought the three Ku-band satellites earlier in the year from SBS. SBS 6 entered service in November 1990. It is in geosynchronous orbit 22,338 miles above the equator at 95 degrees West longitude. SBS 6 provides data, voice, and video communications services to private satellite network customers in the continental United States. Switchable offshore coverage is available on two transponders. SBS 6 spins at 55 rpm. It carries 30 Ku-band channels, 19 operating and 11 spares. Each channel operates in the 43 MHz bandwidth powered by 41 watt traveling-wave tube amplifiers. By comparison, a channel on SBS 4 or SBS 5 produces 20 Watts of power. Each SBS 6 channel transmits on a frequency range of 11.7 to 12.2 GHz and receives on a frequency range of 14.0 to 14.5 GHz. The satellite has a signal strength of 46.5 dBW over densely populated areas of the United States. The satellite uses a 2.4-meter parabolic antenna with a multihorn feed array, an omnidirectional command and telemetry antenna. When it was launched, SBS weighed 5390 pounds. After using fuel during transfer orbit maneuvers, the satellite had an initial on-station weight of 3265 pounds. Fully deployed, the 12-foot diameter spacecraft is 33 feet tall. Like its smaller Ku-band siblings, SBS 6 has a spun section containing its propulsion system and solar drums. Its despun section contains the satellite's communications payload and its antennas. The solar cells -- the HS-393 has more than twice as many a 376 -- generate more than 2000 Watts of power. The satellite's nickel-hydrogen batteries provide electrical power during eclipse operations. Two axial and four radial 5-lbf thrusters are used for stationkeeping, spin control, and attitude control. In addition, SBS 6 used two 110-lbf thrusters for apogee maneuvers and satellite reorientation. SBS 6 was placed into a geosynchronous transfer orbit by its Ariane launch vehicle. About a minute before separation from the booster -- about 20 minutes into the flight -- the satellite's omni command antenna was deployed and the spacecraft started spinning at 5 rpm. Following separation, the satellite's thrusters were fired and its spin rate was increased to 20 rpm. Four separate firings of the two 110-lbf thrusters raised the satellite's perigee to 22,338 miles. 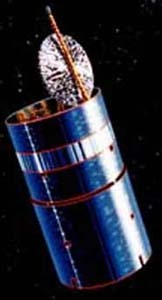 After it drifted to its orbital slot, the SBS 6 communications platform was despun, its solar drum was extended, and its parabolic antenna was raised. SDS 6 was retired froms service in April 2009 and maneuvered to a graveyard orbit.